"Don't take me for a fool just because I'm blind." 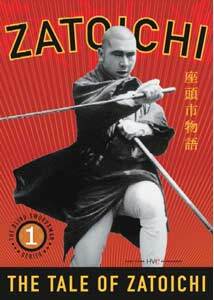 Few film franchises are as successful as that of Zatoichi, the blind swordsman. It generated 25 film sequels as well as 100 television episodes over a period of 20 or so years. This disc, the first of 17 projected volumes, features the pivotal first cinematic adventure of the sightless antihero. Zatoichi (Shintaru Katsu), also referred to as Ichi, is a blind masseur, a member of the lowest caste in feudal Japan. Summoned to Iioka by Yakuza lord Sukegoro (Eijiro Yanagi), he is enlisted to take part in a gang war over gambling turf. Dismissed on account of his blindness, he is a most dangerous opponent and can move his sword faster than the eye can see and with deadly accuracy. The opposing gang in Sasagawa, however, has hired their own secret weapon, the samurai Hirate (Shigeru Amatchi), who is dying from consumption and thus fights with a deadly abandon, a motif swiped by a recent James Bond picture. Although the two warriors strike up a friendship, they must nonetheless face off. The film still holds up as entertainment after 40 years. The introduction of Ichi in a comic gambling session is winning and makes him appealing in a roguish way, even before we're really aware of his fighting capabilities. The pacing is slow, punctuated with occasional glimpses of violence until the last reel, when all hell breaks loose. From there to the end it's practically nonstop combat, artfully choreographed in the weeds and the mud of the riverside. The score, silent for much of the film, suddenly blares out with a percussive sound of Armageddon, brutally punctuating long-held discords. The violence is quite aggressive and in-your-face, though this certainly isn't a gory picture. The main story is supplemented by a number of side stories that vary in effectiveness. Some murky romantic situations are brought up and dropped unceremoniously, making them feel like padding. As was the case in Seven Samurai, the impact of the rifle on samurai warfare is an important subordinate theme here, and this subplot is highly effective. Ichi runs by a code; that much is clear. However, exactly what composes that code isn't quite clarified here. Of course, there are quite a few more pictures left to develop the character. That's probably the strongest point of the picture: while it provides an interesting character, we don't learn everything about him, and are left wanting to know more. For that, tune in to Home Vision's next disc. Image Transfer Review: Oddly enough, the widescreen scope picture is presented in nonanamorphic fashion. Viewers with widescreen sets will need to zoom it, which results in a picture that is lacking in fine detail and plagued with digital artifacts. Black levels are extremely poor, averaging out to a medium grey in most sequences. The source print appears to be in excellent condition, so it's truly a pity that this wasn't given an anamorphic transfer. In addition, it seems to be overly cropped. Heads are chopped off by the top black bar with frightening regularity, raising suspicions that this may have been somewhat zoom-boxed in spots. Audio Transfer Review: The 2.0 Japanese mono sounds adequate for a picture of this age. There tends to be some hiss, noise and pops, but overall it's not terrible. The music seems a shade tinny and is rather lacking in bass. Extras Review: There's not much here in the way of substantive extras beyond a decent set of production notes. A dozen stills are presented on the disc in a size about 1/2 the screen. The keepcase contains four trading cards depicting scenes from various Zatoichi movies. Chaptering is adequate, but that's about all that can be said on this score. A classic and highly influential Japanese sword drama, unfortunately given a mediocre transfer and little in the way of extras.